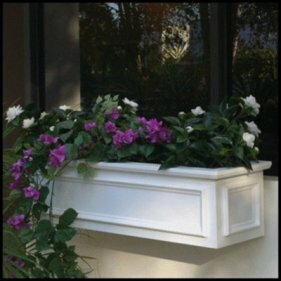 We also supply elegant window box wall brackets that complement this window box sold separately. These are supplied with screws and rawplugs. See image opposite. The Broughton Wooden Window boxes are perfect for any window ledge, wall or fence. The design is elegant and is inspired by our Hatton Wooden window box. A clean design but with decorative mouldings. It is a beautiful way to display your plants and flowers whilst looking good in its own right. 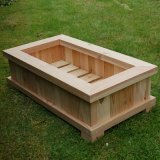 Broughton wooden window boxes are made from Scandinavian red pine with holes in the base for good drainage. The window boxes can be finished in clear, golden brown, wild sage or white preservative. We also offer a selection of Farrow & Ball paint finishes. If your windowboxes are permanently planted push fertilizer pellets into the compost, or sprinkle on a top dressing of granules in spring, Dense displays may need additional liquid feeds when they are flowering. instant trigger spray of the right insecticide or general fungicide may be all you need. However, you may prefer to use a pressure sprayer if you have many awkward to reach windowboxes. prevents the plant putting unnecessary effort into seed production when what is required is flowers and strong growth, and encourages new shoots to grow. It is possible to deadhead many plants-busy lizzies and petunias, for example-by snapping off the spent blooms with your fingernails, but sharp scissors or secateurs deal more cleanly with geraniums and patio roses. Always make your cut just above a leave joint to prevent stems from dying back. The traditional advice for roses was to deadhead and prune them at the same time, by cutting back to a bud somewhere down the new season's stem. More recent tests suggest that you will have healthier bushes if you leave on as much foliage as possible throughout summer, and just cut off any deadheads.